Gotham City becomes a very cold place when Mr. 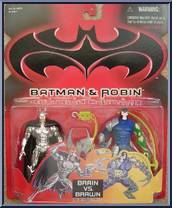 Freeze, Poison Ivy and Bane triple team to plot the icy demise of Batman and Robin. 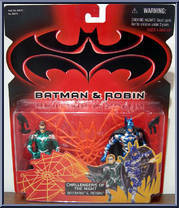 The crimefighters respond immediately by using the Batcomputer deep withn the Batcave to develop an array of cutting-edge weapons that can be used in their battle against this multitude of fiendish foes. 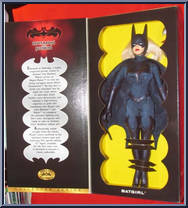 Discover the Secrets of the Batcave! 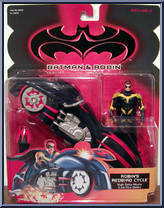 - secret technology that gives Batman, Robin and Batgirl the ultimate ability to save Gotham City! 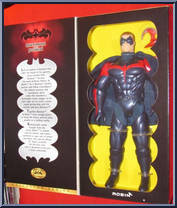 Special edition Collector series, 6 batman logos on the side open panel. 6 different languages that read " As he tried desperately to preserve his ailing wife in a cryogenic sleep, a terrible acc. 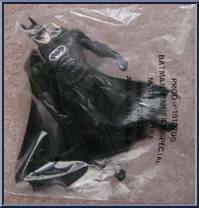 . .
COVERT STRIKE CAPE ABILITY The cold front moving through the streets of Gotham City lately is the diabolical doings of Mr. Freeze, Poison Ivy and Bane plotting to put the Dynamic Duo on ice! 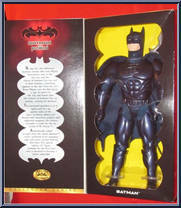 Batman an. . .
with Ice Shatter Missile and Vine Attack Blades! 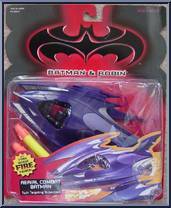 Fight crime in Gotham City with this hot, new movie version of the Batmobile. The cockpit, headlights and taillights light up for thrilling night chases! Villains beware! 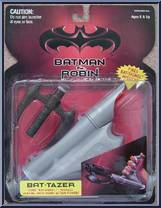 Unique Batman controller o. . .
Strap it to your arm and fire the Batarang! 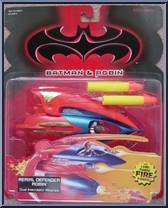 Send "Bat-Signal" missiles soaring with pump-action power! 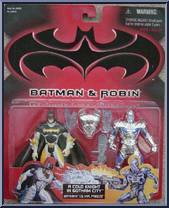 Double-Attack Ace & Colossal Crusher Gauntlet Gotham City becomes a very cold place when Mr. 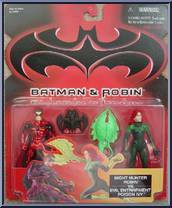 Freeze, Poison Ivy and Bane triple team to plot the icy demise of Batman and Robin. 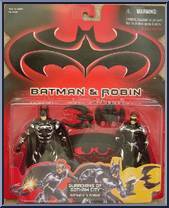 The crimefighters . 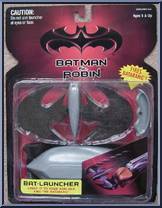 . .
Opti Scope Launcher & Laser Ray Emitters Gotham City becomes a very cold place when Mr. Freeze, Poison Ivy and Bane triple team to plot the icy demise of Batman and Robin. The crimefighters respo. 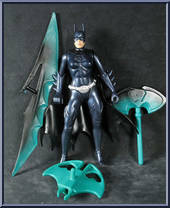 . .
Blasting Battle Sled & Sickle Shields Gotham City becomes a very cold place when Mr. Freeze, Poison Ivy and Bane triple team to plot the icy demise of Batman and Robin. The crimefighters respond . 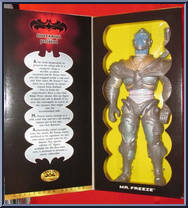 . .
Ice Ray Cannon & Rocket Thrusters Gotham City becomes a very cold place when Mr. Freeze, Poison Ivy and Bane triple team to plot the icy demise of Batman and Robin. The crimefighters respond imme. . .